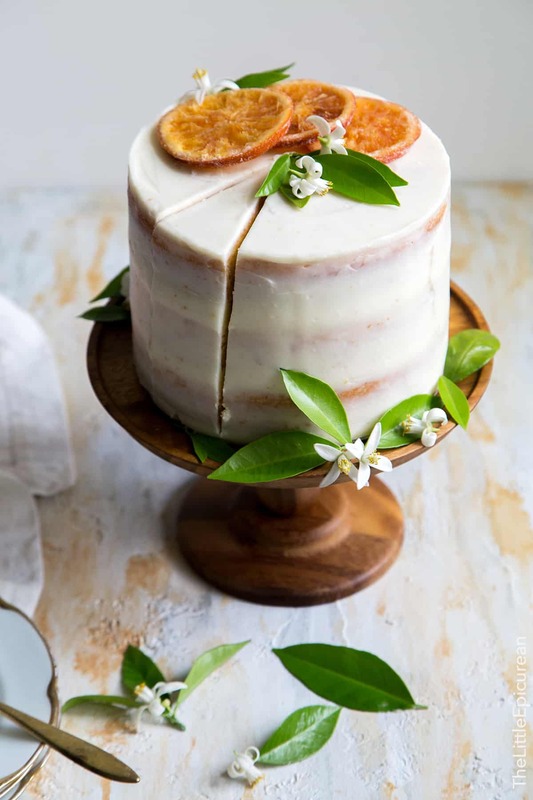 Orange Marmalade Cake: three layers of vanilla cake soaked with ginger liqueur, filled with Seville orange marmalade and lightly frosted with orange blossom buttercream. Spring has become such a bittersweet time for me. My late father’s birthday is coming up. It’s the second birthday I’ll be celebrating without him. I’m still hopeful that it will get better, that it will get easier, that I’ll learn to miss him less. I often dream about him and we have the funniest, most interesting conversations in my sleep. I thought of him when I made this cake. For his upcoming birthday, I’ll celebrate him by eating his favorite foods (meaning fried foods all weekend!). 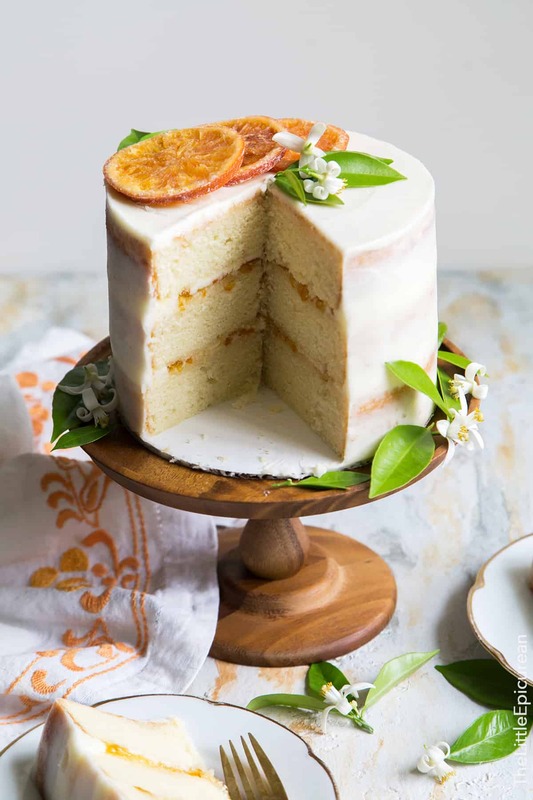 This orange marmalade cake was inspired by the movie Paddington Bear. Have you seen it? I remember reading the books as a kid, and I had no idea what to expect with the movie. It exceeded my expectations and I was very much entertained and amused. And by the end of the movie, Paddington had me craving an orange marmalade sandwich. Apparently the UK experienced a spike in marmalade sales following the release of the Paddington Bear movie. I believe it. Days after the movie, I still had marmalade on the mind. Marmalade isn’t something I normally have at home. When I spotted a jar of marmalade at Trader Joe’s I immediately grabbed it and started envisioning this cake. I used the yellow cake recipe from my previous chocolate yellow cake. That yellow cake is really growing on me. I love how versatile it is and how well it compliments other flavors. I lightly soaked the cake layers with a ginger syrup made from simple syrup with a splash of ginger liqueur. This helps keep the cake moist and also adds another dimension of flavor. Be sure to use Seville orange marmalade. It’s the traditional bitter kind. 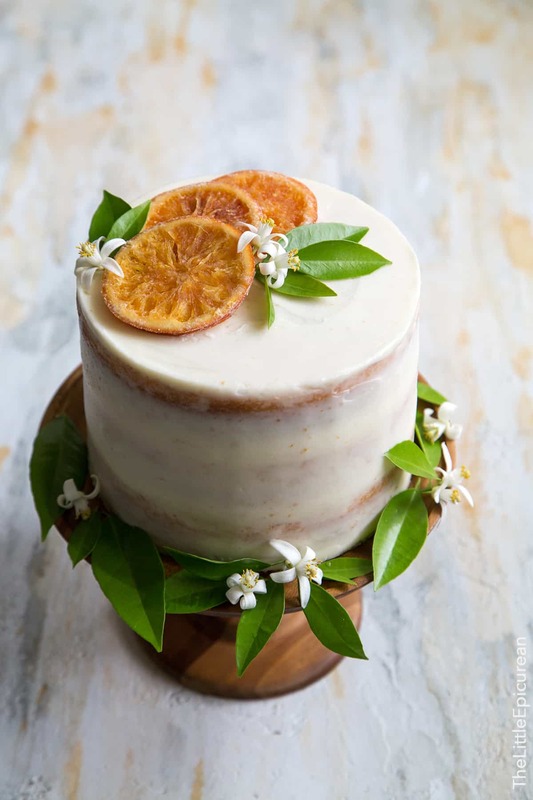 The bitterness works well with the sweet and floral orange blossom buttercream. I am the biggest fan of orange blossom water. It smells lovely and tastes like an explosion of flowers. Store-bought orange blossom water is rather potent. Use it carefully. The decor (orange blossoms and leaves) came from my little orange tree. Every spring it produces tons of little beautiful white buds. I have yet to actually harvest any fruit, but I love the sweet fragrance the blossoms release. I’m keeping my fingers crossed that I’ll be able to harvest oranges next year! Preheat oven to 350 degrees F. Grease and flour three 6-inch round cake pans. Line with parchment paper and set aside. In the bowl of a stand mixer, whisk together 2 cups flour (reserve remaining 1/2 cup of flour), sugar, baking powder, and salt. Using a paddle attachment, run mixer on low speed. With the mixer running, add butter in three additions. Continue to mix on low speed until mixture is crumbly. In another bowl, combine milk, eggs, egg white, and vanilla. Add half of liquid to mixing bowl. Mix on medium speed until incorporated. Add remaining half of liquid and mix until batter is thoroughly combined. Scrape down bowl as needed to ensure thorough mixing.. The batter may look curdled. Add remaining 1/2 cup flour and mix until batter comes together. Evenly distribute batter among prepared cake pans and level batter. Bake for 30-35 minutes until toothpick inserted in center of cake comes out clean. Allow cake to cool in pan for 10-15 minutes. Run an offset spatula along the sides of the cake pan to loosen cake. Invert cake onto a wire rack and allow to cool to room temperature. Combine simple syrup* and ginger liqueur before assembling cake. In the bowl of stand mixer fitted with a paddle attachment (or using a hand mixer), cream butter until smooth. Add powdered sugar and mix until incorporated. Scrape down bowl as needed. Add orange blossom water, vanilla extract, and salt. Mix until thoroughly combined. Place one cake round on cake board (or serving plate). Lightly soak cake with ginger syrup. Spread a thin layer of buttercream over cake layer. Pipe a border of buttercream along the perimeter of cake. 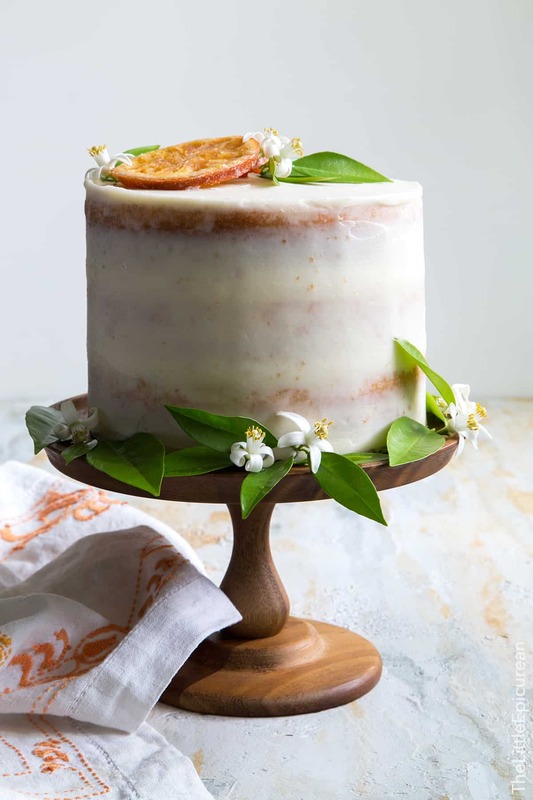 Spread orange marmalade within the buttercream border. If desired, carefully spread thin layer of buttercream over marmalade. Top with second cake round and repeat steps. Top with third cake round. Spread thin layer of buttercream over third cake. Spread thin layer of buttercream around the exterior of cake to seal in any crumbs. Chill in the fridge to set up. If desired, add another coat of buttercream. Keep chilled in the fridge until ready to serve. 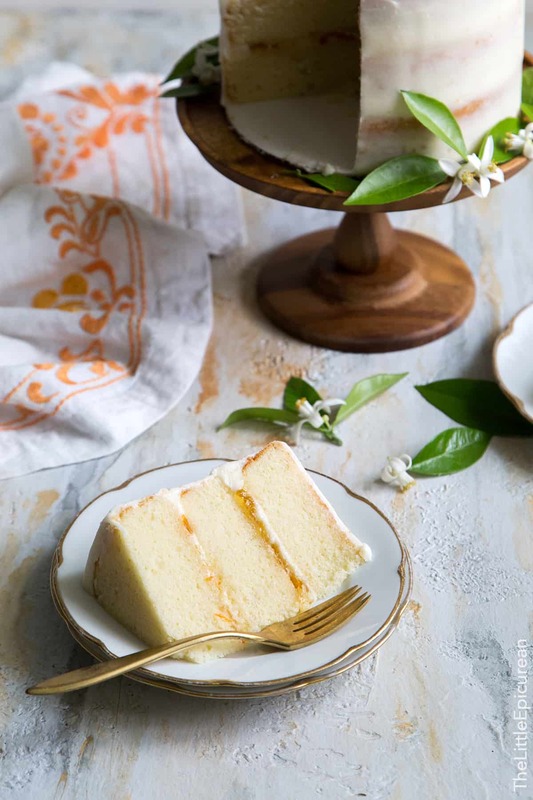 Allow cake to sit at room temperature for 20-30 minutes before serving. 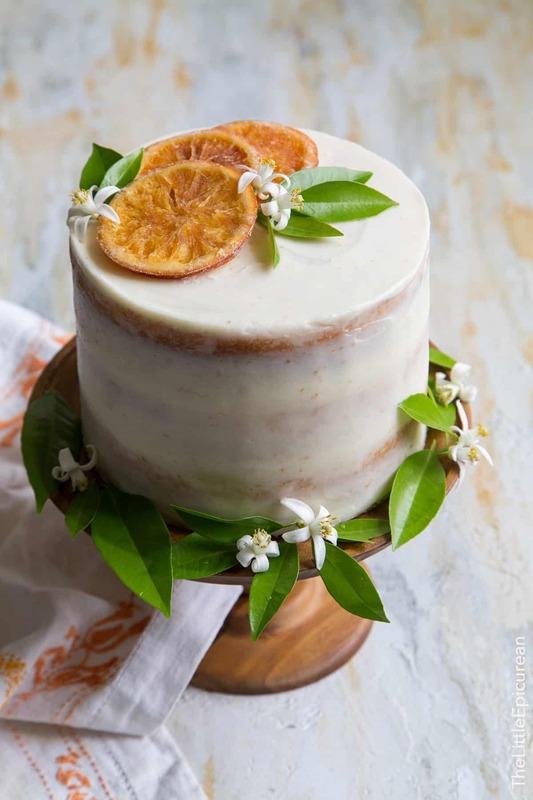 Before serving, garnish cake with dried orange slices and fresh orange blossoms. *Simple Syrup: Simple syrup is made by boiling equal parts water and sugar to a boil until sugar has dissolved. Cool to room temperature and keep stored in the fridge until ready to use. If desired, simply omit the ginger syrup. Be sure to use Seville orange marmalade. The sweetened dried orange slices are from Trader Joe's. What a beautiful cake! I bet it tastes and smells amazing! This is one gorgeous cake! Your pictures are stunning! That is absolutely gorgeous and I’ll bet it tastes every bit as good, yum! Such a seriously gorgeous cake! That is one lovely cake! I love the marmalade in there too! I know you stated the ginger syrup can be omitted, but what could it be replaced with? I’m not a fan of ginger. Simply omit the ginger and just use plain simple syrup.